As can be readily seen here, the IM of human and sasquatch are remarkably similar but certainly not identical. It is this difference that an be used to make qualitative evaluations on reported sasquatch photographs and videos. If we return to Frame 72 of the Patterson Gimlin Film again, the arm length and the leg length are readily apparent and can be easily measured. Also, the arm and the leg are at the same distance from the lens in the same plane so no distortion due to foreshortening is introduced into the exercise. The previously discussed calculation using the formula provided by Dr. Meldrum yields an IM of this figure to be 84. That measurement and calculation places it firmly into the range expected from its species. At this point the ardent skeptic would state something like, “Oh they just used an arm extender to make it correct…” Let us examine this more closely. This means, simply stated that my arm length of twenty five inches would have to be extended by four inches to achieve the desired result. In viewing the figure here, where would that four inches be added? If it were done as in the figure above, that would make the lower arm well out of proportion to the upper arm. In Frame 72, it is very evident that the elbow is exactly where it should be placed in the arm. As has been stated by GraphicArtist/Designer Bill Munns: “The elbow cannot be relocated.” It simply is where it is. A common ploy to trick the eye is to use oversized hands in the form of huge gloves to convey the idea of a longer arm. There was a recent video released by a fellow attempting to “disprove” the Patterson-Gimlin film… He used this ploy, but the result was so emphatically terrible, it is beyond reason to ever believe it could be even remotely possible. Look at the hands in the film and it is readily apparent that they are in proportion to the rest of the body, not some outsized grotesqueness perpetrated by one who would have us believe his tripe. There is one other method for achieving the desired ratio. Perhaps one could reduce my leg length to the requisite twenty nine inches by somehow removing five and a half inches from its present length. 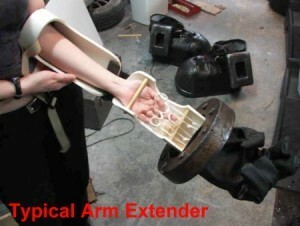 Somehow, I think that might be even more objectionable to me than the process of adding the needed length to my arms. In short, there is really no feasible way short of surgery to alter this Intermembral Index formula or measuring criteria. 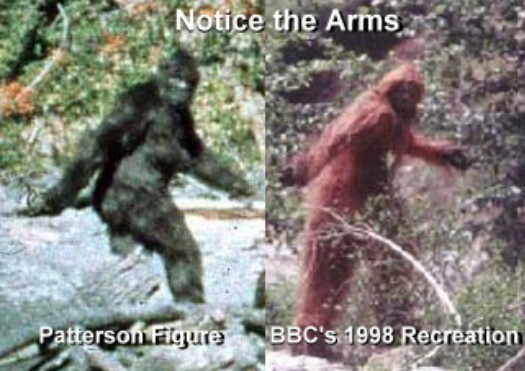 In 1998, BBC presented a program designed to debunk the Patterson-Gimlin Film… in that effort, they had constructed a suit that was the state of the art for that time… the red figure in the photo is that suit… as one can readily see, the arms prove it to be a suit… and, add to that, the head sits up on a pedestal allowing it to rotate on that pivot to look behind whereas the Patterson figure has no such pivot and must open her shoulder to see behind her… One again, as all such efforts have done, they PROVE the authenticity of the film rather than to debunk it. In this regard the American version of this X-Creatures episode was quite different from the version broadcast on British TV. The American version (shown on the Discovery Channel) focused attention on the Hollywood costume designer’s attempt to build a “matching” costume. The British version left this part out completely. During the costume building sequence the designer hints at the difficulty they had matching their costume to the figure in the footage. Among other things, they could not match the fur with artificial fur, and they could not recreate the large moving muscles in the Patterson figure. Nevertheless, Packham touted their creation as an “exact match” of the Patterson creature, and even showed the “matching” costumes side by side . It should be noted that after airing of this “Documentary”, BBC stated that it did not, in any way, disprove the validity of the PGF.